One of the most perfect and important Norman churches in the country, due to the lack of significant alterations since it was built in the 12th century. The church has a round tower, with circular splayed windows which retain the impression of basketwork from their construction. The apsidal chancel is decorated with blind arcading, and the elaborately decorated nave doorways are among the best examples of 12th century doorways in the county. The church also contains 14th century wall paintings of St Christopher and St James, and a fine octagonal 15th century font with carvings of angels, Tudor roses and lions. Late prehistoric and medieval pottery have been found in the churchyard. Church (redundant) has round Saxo Norman tower perhaps predating nave. Both contain conglomerate and possible Roman brick. Nave and apsidal chancel with elaborate scheme of Norman decoration, possibly on older core. Windows and belfry about 1300, rood stair inserted in window ?15th century. Several wall paintings, good 15th century font, unusual ?19th century painting on Jacobean font cover. 1982 to 1983. From yard. E. Rose (NAU) 27 July 1987. (S3) and (S4) describe the architecture of the church, which has elaborate Romanesque details. The apsidal chancel is decorated with blind arcading. 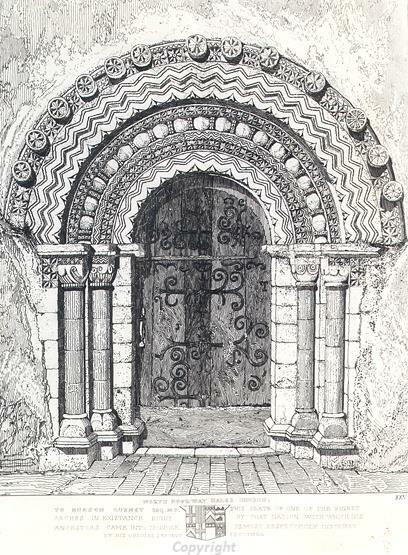 The nave doorways are considered to be among the best examples of Norman doorways in Norfolk. 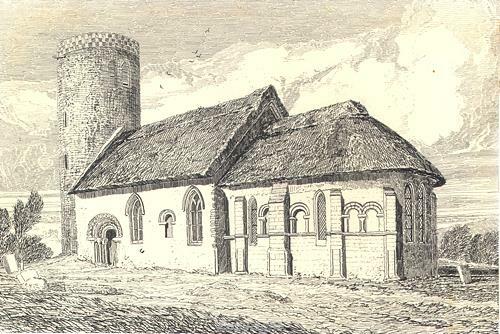 Both (S3) and (S4) interpret the tower as being contemporary or slightly later than the nave, (S3) concluding that the tower may have been added to an existing building. The tower has circular splayed windows, which still bear the imprint of basketwork left when the windows were constructed. The church has a fragmentary 14th century wall painting of St Christopher, and another of St James. (S4) states that St Margaret's is one of the most important 12th century churches in the country. See (S3) and (S4) for more details. S. Spooner (NLA) 25 January 2006. The circular windows and wallpaintings mentioned in the preceding paragraph are described in (S1). (S5) returns to the theory that the tower is Saxon and the remainder of the church Norman. 2006. Inspection of the interior of the tower confirms the present belfry is a 14th century addition; the earlier belfry has internal Norman mouldings and Caen stone detailing; however there remains the possibility that the base is Saxon. See (S6) in file. E. Rose (NLA), 4 February 2006. --- Aerial Photograph: TM3896 A-F,G,H,J,K. --- Monograph: Davison, A.. 1990. The Evolution of Settlement in Three Parishes in Southeast Norfolk.. East Anglian Archaeology. Vol 49, p 46. --- Unpublished document: Halfacre, E.. 1999. Norwich Diocesan Advisory Committee Report on a Visit to a Church; Hales St Margaret. March. --- Newspaper Article: Eastern Daily Press. 2001. Photograph of St Margaret's Church. 18 April. --- Newspaper Article: Eastern Daily Press. 1999. Photograph of St Margaret's Church. 7 September. --- Newspaper Article: Eastern Daily Press. 2009. Twelve churches are picture perfect. 3 April. --- Leaflet: The Churches Conservation Trust. 2004. St Margaret's Church, hales, Norfolk.. The Churches Conservation Trust. --- Unpublished document: Randall, G.. 2010. WEA Norwich Branch practical church exploration course report for St Margaret's Church, Hales..
--- Newspaper Article: Eastern Daily Press. 2010. A towering piece of Norman church architecture. 20 October. --- Photograph: Photograph of St. Margaret's Church, Hales. Colour. --- Archive: Clarke, R. R. and NCM Staff. 1933-1973. Norwich Castle Museum Record Card - Roman. Hales. --- Archive: Clarke, R. R. and NCM Staff. 1933-1973. Norwich Castle Museum Record Card - Medieval. Hales . <S2> Newspaper Article: Eastern Daily Press. 1987. Wall paintings found. 10 July. <S3> Publication: Heywood, S.. 2004. St Margaret's Church, Hales, Norfolk..
<S5> Serial: Pevsner, N. & Wilson, B.. 1989. The Buildings of England. Norfolk 2: North-West and South..